It was a four-day of momentous event for those who had one eye defect or another in the ancient city of Badagry, Lagos. Many of them had been living in pains for years without hope of any help. Some had cataract and others struggled with partial blindness. However, help came to them recently when Lagos State Government sponsored a free eye surgery outreach programme. Many of the excited beneficiaries wished the programme would be a weekly affair. One of them, Mr. Sanni Sonayon Rilwan while thanking the State government for coming to their aid and offering them succour stated that the gesture is a reminder that people in hard-to reach-areas are not left out in development programmes. He added that it was an endless wait for him to source for money for an eye surgery as the cost was too high for him to afford. He however stressed that the free surgery programme has put an end to his long wait and restored his vision. No fewer than 200 people benefitted from the free eye surgery outreach programme which was one of the latest phases organised by the Lagos State Government. The State authorities said that programme is aimed at improving the quality of life of the beneficiaries by restoring their vision through surgical intervention. Dr. Jide Idris, the State Commissioner for Health, stated that the programme is significant and defining for those who suffer from eye ailments requiring surgery like cataract and pterygium. Idris spoke while on a recent visit to the General Hospital, Badagry, which was the venue of the surgical intervention to assess its progress. 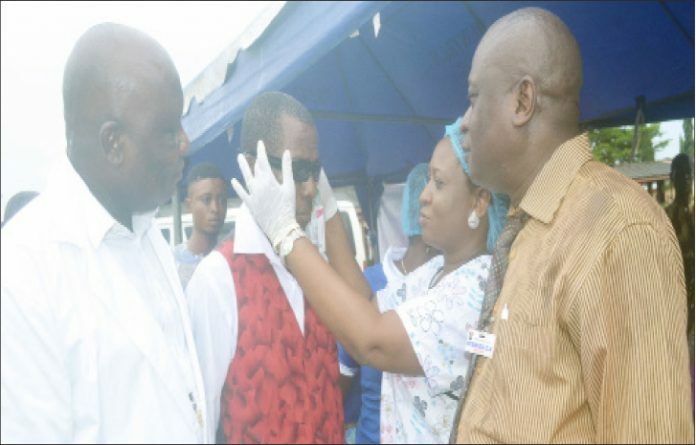 The Ministry of health boss who was represented by Dr. Funmilayo Shokunbi, the Director, Medical Administration, Training and Programmes in the Ministry of Health, added that free eyes screening and surgery outreach programme is one of the ministry’s prevention programmes to reduce avoidable blindness in Lagos. He said; “75 per cent of blindness all over the world can actually be prevented or treated, and the main causes of avoidable blindness and serious visual loss are uncorrected refractive errors, un-operated cataract amongst others”. “This is why the Lagos State government through the Ministry of Health is intensifying its blindness prevention activities which include, community outreaches, school eye screening programme, free surgical interventions and provision of free eye glasses and medication in-order to reduce avoidable blindness in the State”. The Commissioner explained that the Ministry of Health in its quest to reduce avoidable blindness have visited six local government areas since the beginning of the year on blindness prevention screening and awareness outreaches, adding that public schools have also been visited while free corrective eye glasses have been given to pupils who require them to aid their vision. Idris while urging latest set of beneficiaries to take good care of their eyes stressed that post-operative care is as important as the surgery they have undergone. He thereafter encouraged them to visit the health facility they have been referred to for follow up care. “Do not engage in strenuous activities; avoid bending down, robbing your eyes and using un-prescribed medications. Adopting good personal hygiene and environmental sanitation is key in the process to full recovery,” he noted. Idris while explaining that though the services provided to patients through the eye surgery outreach programme are free however noted that they are not free to government. The Commissioner stressed that the eye surgery outreach programmes are funded by tax payers’ money to bring succour to patients that cannot afford the cost of treatment. Responding, Dr. Opeyemi Aihonsu, the Medical Director, Badagry General Hospital, noted that his hospital has an eye clinic that has been standardised and equipped such that all services required for investigations, medical and surgical treatment of common blinding conditions can be accessed. He gave kudos to the Lagos State Governor for supporting the drive to ensure reduction of avoidable blindness in the State. Dr. Aihonsu further noted that the eye unit in Badagry Hospital has competent personnel who can take care of the post-operative management of patients that have been operated on. “We have consultant ophthalmologist, optometrists, ophthalmic nurses and other eye care staff and we make bold to say we are ready to take care of the post-operative management of patient referred to us for follow up,” he said.